Hibernian moved level on points with Scottish Championship leaders Rangers after Dominique Malonga headed a late winner against Queen of the South. With Rangers losing at Falkirk earlier in the day, the incentive was clear for Alan Stubbs' men. Liam Fontaine, James Keatings and Jason Cummings all came close as Hibs probed. And the hosts' pressure told in the fourth minute of stoppage time as David Gray crossed for Malonga to nod past Robbie Thomson. The visitors defended stoutly all afternoon and were far from happy since the goal came when the ball was dropped to Hibs following to an injury to Kyle Hutton. Hibs, who visit Rangers on 28 December, started strongly as Fontaine headed wide. Queens then responded with Mark Millar's free-kick saved by Mark Oxley. A stinging effort by Cummings was kept out by Thomson and, in the second half, Keatings fired a free-kick over before substitute Malonga's effort was deflected wide. Queens, for their part, remained a threat and Millar drew another save from Oxley. Any prospect of a winner looked to have dwindled until captain Gray broke forward from the drop ball and his deep cross was met by Malonga at the back post. 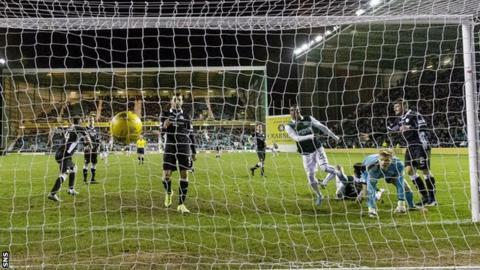 For the second week running, Hibs fans were celebrating a stoppage-time goal as their unbeaten run stretched to 17 games. Match ends, Hibernian 1, Queen of the South 0. Second Half ends, Hibernian 1, Queen of the South 0. Islam Feruz (Hibernian) wins a free kick in the defensive half. Foul by Andy Dowie (Queen of the South). Liam Henderson (Hibernian) is shown the yellow card. Chris Higgins (Queen of the South) is shown the yellow card. Goal! Hibernian 1, Queen of the South 0. Dominique Malonga (Hibernian) header from very close range to the top right corner. Assisted by David Gray. Substitution, Queen of the South. Darren Brownlie replaces Ryan Conroy. Corner, Hibernian. Conceded by Lewis Kidd. Substitution, Hibernian. Islam Feruz replaces James Keatings. Substitution, Queen of the South. Jake Pickard replaces Derek Lyle. Mark Millar (Queen of the South) is shown the yellow card. Fraser Fyvie (Hibernian) wins a free kick in the attacking half. Foul by Mark Millar (Queen of the South). Corner, Queen of the South. Conceded by Lewis Stevenson. Attempt missed. Liam Fontaine (Hibernian) header from the centre of the box is close, but misses to the right. Corner, Hibernian. Conceded by Kyle Hutton. Corner, Hibernian. Conceded by Mark Millar. Attempt blocked. John McGinn (Hibernian) right footed shot from the left side of the box is blocked. Substitution, Queen of the South. Aidan Smith replaces Iain Russell. Attempt missed. David Gray (Hibernian) header from the centre of the box is close, but misses to the left. Corner, Hibernian. Conceded by Kyle Jacobs. Attempt blocked. Dominique Malonga (Hibernian) right footed shot from the centre of the box is blocked. Foul by Henri Anier (Hibernian). Kyle Hutton (Queen of the South) wins a free kick in the defensive half. Substitution, Hibernian. Henri Anier replaces Jason Cummings. Substitution, Hibernian. Dominique Malonga replaces Martin Boyle. Attempt missed. Ryan Conroy (Queen of the South) left footed shot from long range on the right is close, but misses the top left corner from a direct free kick. Lewis Stevenson (Hibernian) is shown the yellow card for a bad foul. Iain Russell (Queen of the South) wins a free kick in the defensive half. Attempt blocked. Darren McGregor (Hibernian) right footed shot from the centre of the box is blocked. Attempt missed. James Keatings (Hibernian) left footed shot from outside the box is just a bit too high from a direct free kick. James Keatings (Hibernian) wins a free kick in the defensive half. Foul by Chris Higgins (Queen of the South).